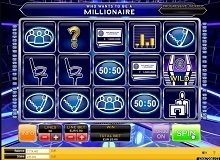 Who Wants to be a Millionaire is a fascinating money-themed virtual slot from Ash Gaming’s portfolio. The game is named for the famous TV show by the same name and every aspect of this casino slot including the blue theme colour, symbols, and the soundtrack is inspired by the show. The main highlights of the game include a free spins bonus mode, wild pays of up to 5000x your line bet, and an amazing progressive jackpot prize of $1 million to ensure that the slot lives up to its name. Read on to find out how to play Who Wants to be a Millionaire slot machine online and how to trigger the progressive jackpot. 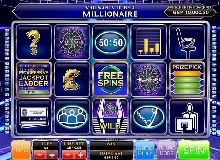 Who Wants to be a Millionaire game plays over 5 reels, 3 rows, and 20 paylines. The paytable features a variety of symbols that relate to the original show. The standard icons are the Show logo, Answers, Euro sign, Question Mark, Phone a Friend, Audience, 50:50 icon, a €1 Million Check, the Questioner, and Black Chair. You can easily play Who Wants to be a Millionaire casino slot online by following the following steps. Choose the number of play lines you wish to activate. The options are 1, 10, 20, 30, 40, and 50. Choose a line wager using the -/+ icons on the LINE BET button. You can stake as little as €0.01 per line to as much as €6, which translates into a total bet of between €0.50 and €300. Click on SPIN to set the reels in motion. This slot machine does not have an autoplay feature, but you can turn on TURBO mode to speed up things. Winning in this game is pretty easy. All you have to do is land a set of 3 similar icons on successive reels and you’re awarded a prize that is equal to your line bet multiplied by the symbol multiplier. You can also get a win if the wild substitutes any other element on a line. All wins pay from the left, and you will hear the audience cheer in the background as the machine calculates your payout for each round. When it comes to the prizes, the most valuable symbol in Who Wants to be a Millionaire is the Wildcard. It has a maximum payout of 5000 coins for an exclusive 5-of-a-kind combination. It is followed by the Show logo which awards up to 2,500x your line bet if you land a set of 5 matching icons. The least valuable characters are the Check, Questioner, and Black Chair, each awarding 7 coins, 25 coins, and 50 coins for 3, 4, or 5 symbols respectively. Apart from your regular winnings, the machine also gives you the chance to boost your payback with 3 rich bonus features. 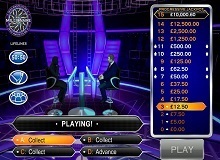 Who Wants to be a Millionaire Slot uses a random number generator to pick the winning lines in each round, and the bonuses are also awarded randomly. It is therefore impossible to manipulate the outcome using cheats. You can unlock 10, 15, or 20 Who wants to be a Millionaire? Free games if you land 3, 4, or 5 free spins icons during a round. During this feature, the machine awards you extra Wilds in the form of Timers. These wilds shift 1 reel to the left with each spin until they disappear from the grid, and this is what the Shifting Wilds feature is all about. This freebie is triggered when 3, 4, or 5 Prize Pick symbols appear in any positions on the screen. The characters transform into SELECT ANSWER icons and you can pick any of the choices to reveal your random bonus. You can get up to 1000x your line bet if you’re lucky. This is the most lucrative bonus in the game, and the feature is also pretty interesting. 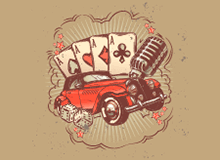 The progressive jackpot is unlocked by a set of 3, 4, or 5 Jackpot Ladder icons. The objective of this round is to scale up a money ladder and with luck you can go up 15 steps to win the ultimate jackpot prize of €1 Million. You can make use of the free advances and Lifelines – 50:50, Phone a Friend, and an audience Vote to help you land a great prize. Every player would want to cash in on the 1 million jackpot prize, and this is just one of the reasons why you should try this game. The slot is fully wild and exciting features to keep you enthralled, and there are lots of money-spinning bonuses to give your payroll a boost. The base game is also rich enough to guarantee regular and decent payouts during the spins and this mainly because the slot has a favourable RTP of 95% and medium level volatility. If you’re looking for a rich and rewarding slot game that will make your investment worthwhile, you can play Who Wants to be a Millionaire for real money in various Ash Gaming casinos online today.